Happy World Water Day! On Friday, March 22, the UN and others will host hundreds of events around the theme of “leaving no one behind.” About 99 percent of Americans have safely managed water. 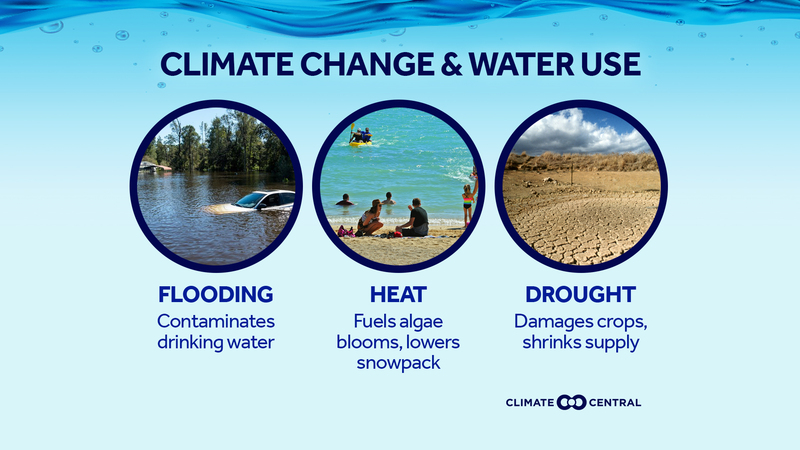 But as climate change leads to more flooding, drought, and heat, this changing weather could put our water supply at risk. With heavier downpours and rising sea levels, the resulting floods could mean more drinking water contamination. Heavy rain led to more than one billion gallons of sewage overflow in 2015-2016, according to a 2016 Climate Central report. As climate change supercharges the water cycle, major downpours will happen more — as seen in the rainfall records this winter and last year. On the coasts, rising seas can accelerate the push of saltwater into underground wells. Florida’s Broward County expects to lose 41 percent of its coastal well field capacity in the next 50 years. Water supplies are also vulnerable to drought. 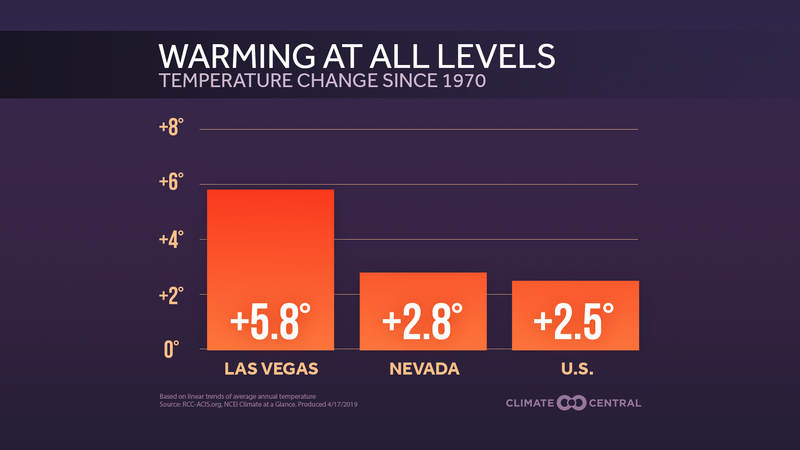 While this winter’s rain and snow have alleviated some current droughts, increased evaporation from global warming makes droughts worse overall. When water use increases in drought-prone areas, groundwater is depleted. In the High Plains Aquifer, the largest aquifer in the contiguous U.S., the rate of water withdrawal is nearly 10 times the rate of natural recharge — threatening the productivity of a key agricultural region. 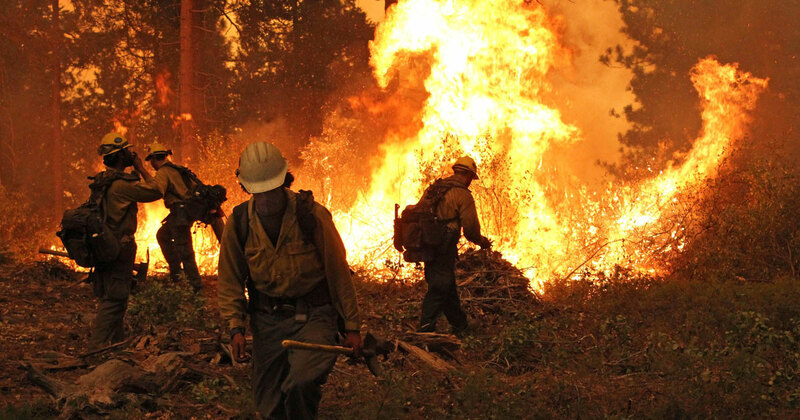 Warmer temperatures influence more than rain and drought. 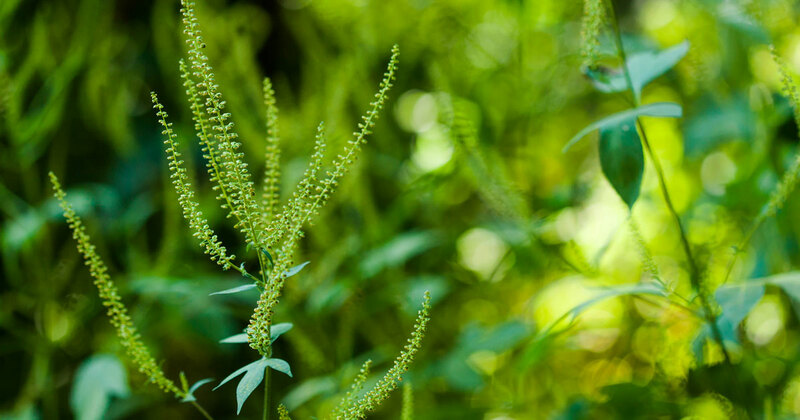 They also spur the growth of certain toxic algae, contributing to a recent increase in algae blooms. Increased warmth also reduces the Western snowpack that supplies irrigation and drinking water, although this year’s snow made for a happy exception. Water supply disruptions will particularly affect the nation’s agriculture and energy sectors. 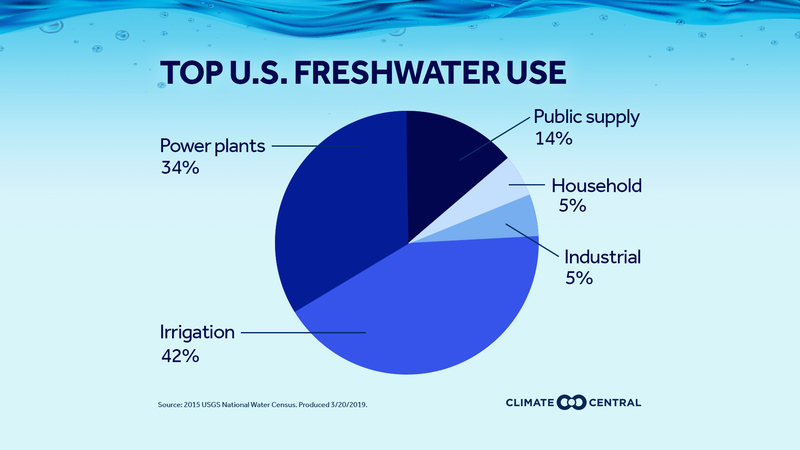 That’s because these groups account for three-fourths of U.S. water use, according to the USGS National Water Census. Irrigation is the thirstiest sector throughout the West, while the thermoelectric needs of power plants are highest in most other interior states. 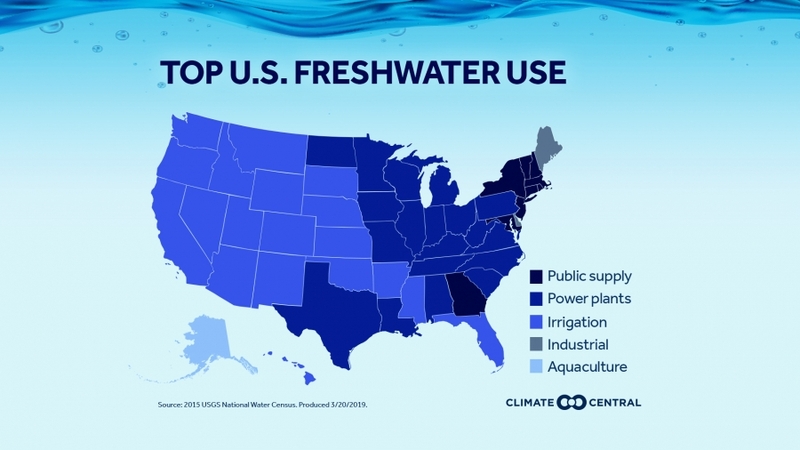 Other top users include industry, aquaculture, and public use such as municipal drinking water. The global ramifications are even greater. Four billion people already face severe water scarcity for at least one month each year. To meet the UN’s goal of sustainable water for all by 2030, the effects of climate change cannot be ignored. Methodology: Graphics show water use data from the 2015 USGS National Water Census (released in 2018). Only freshwater withdrawals were included. A full glossary and history of the use categories can be found at the corresponding links.